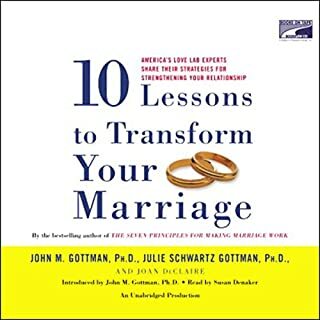 What other book might you compare Ten Lessons to Transform Your Marriage to and why? Who would you have cast as narrator instead of Susan Denaker? Content is good. However, this book is not available on Wispersync, so when trying to follow between book and audio, extremely difficult to find start/stop of chapters, etc. (Book chapters are not even close to audio chapters). For example, the beginning of chapter 3 of the book actually starts within the audio version of chapter 4 @ 1:01:45. VERY hard to find where one left off in the printed book within the audio book.